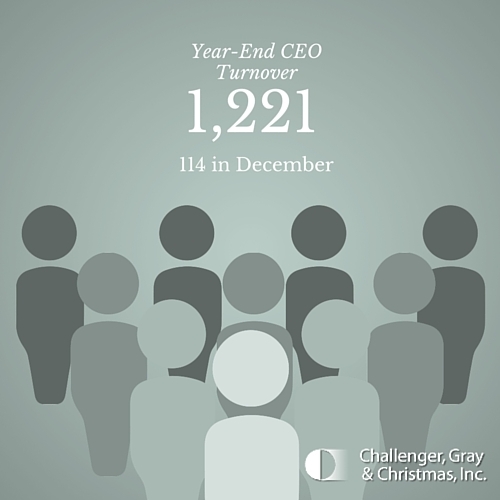 2015 December CEO Report: 114 CEOs Out in December Bring Yearly Total to 1,221 | Challenger, Gray & Christmas, Inc. Despite the December surge, total CEO departures of 1,221 in 2015 were 9 percent lower than the 1,341 CEO departures tracked in 2014. It was the lowest annual total since 2012 when 1,214 chief executives announced their exits. The final quarter of the year saw 294 CEO departures, down 11 percent from the 332 CEO changes recorded during the same period in 2014. Government/non-profit entities, which include universities, foundations, and chambers of commerce, led all industries with 27 CEO changes in December and 188 for the year, 5 percent fewer than the 198 tracked in all of 2014. Financial firms and hospitals tied for second most CEO changes with 137 each. Financial companies announced 18 CEO departures in December, while Hospitals announced 11. Challenger began tracking hospitals and other health care entities separately in 2015. Computer companies place third for CEO departures with 107, 17.8 percent fewer than the 130 announced departures in 2014. Healthcare companies, excluding hospitals and hospital systems, announced 93 CEO changes. 2015 failed to see much change in the way of female leaders. Of the 1,025 replacements Challenger has tracked this year, 868 or 85 percent, were men, which was equal to the percentage last year. The number of women replacing men increased slightly by 5 percent from 103 in 2014 to 108 last year. The number of women replacing women stayed virtually constant, as did the the number of instances where departing female CEOs were replaced by men. In 2015, 179 women, or 14.6 percent of all CEOs, left the CEO position. Of those, 21 reportedly became CEOs elsewhere. In 2014, 198 women left the CEO position, 14.7 percent of the 1,341 2014 CEO changes, 22 of whom reportedly went on to become CEO of another organization. Challenger began tracking interim CEOs who became permanent in June of this year. Since June, 7 interim CEOs were chosen to remain permanently. The same number of CEOs retired as resigned (309) resigned this year, while 241 stepped down into other c-level or board positions. Forty executives were ousted, usually by the board, left amid scandal or fell into legal trouble, compared to fifty who left for the same reasons in 2014.